Gearing Efficiency – STOBER Drives Inc.
Gear reducers are widely used throughout all types of industries. Reducer efficiency is determined by a number of factors, including the type of gearing used, the number of gear stage reductions, oil type and viscosity, bearings, and seals. The focus of this article will be an analysis of efficiency in relation to the type of gearing used and the number of gear stages. There are numerous types of gearing available in the market today. One of the more common types of gears is a worm gear. With a worm gear, the motor shaft is coupled to a worm gear, which drives the worm wheel. This provides an output motion that is 90 degrees from the input motion. The meshing action of this gearing occurs across a relatively large surface area and consists of a sliding motion. The sliding motion across the large surface area creates friction which is equal to the inefficiency of the gear. The efficiency of a worm gear is also determined by the ratio of the worm gear. High ratio worm gears have a smaller gear tooth lead angle, which increases the surface contact area between the gears. The higher contact area creates more friction between the gears and causes lower efficiency. Typical efficiency for worm gearboxes is approximately 49% for 300:1 ratio and approximately 90% for a 5:1 ratio. A variation of the worm gear is the helical worm. In a helical worm, a set of helical gearing is placed on the input of the gear reducer between the motor shaft and the worm gear. The arrangement of the stages of gearing in a helical worm affects the efficiency. The helical gear set reduces the input speed of the worm gear set. This allows the ratio of the worm gear set to be lower, increasing the efficiency of the system. Typical efficiency for helical worm gearboxes is 79% for 300:1 ratio and 90% for 5:1 ratio. There are other right angle options, such as the helical bevel. The input stage gearing is a helical set that is similar to the set used in helical worm; however, it is paired with a spiral bevel set instead of a worm set. The bevel set minimizes friction between the gears which will increase the efficiency of the system. The spiral bevel set is capable of maintaining a high efficiency even at higher ratios. The drawback to the spiral bevel set is it costs more to manufacture, but this additional cost will be offset over the life of the unit by energy that will be saved during operation. Additionally, the initial cost can often be offset by the ability to use a smaller gear reducer, motor, or both due to the entire system being more efficient. 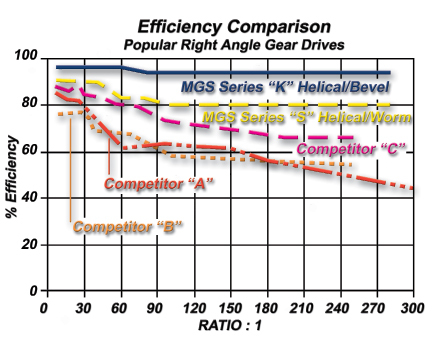 Typical efficiency for helical bevel gearboxes is 94% to 97%. Using an inline helical unit instead of a right angle gearbox or planetary gearbox can help offset the initial cost. The inline helical unit offers similar efficiency as helical bevel and planetary units. It also supplies similar output torques for helical bevel units that are relatively the same size. The planetary units are two to three times smaller than the inline units but can provide similar torques as inline units. There are several versions of inline units. In one version, the input centerline and the output centerline are the same. In another version, the input centerline and the output centerline are offset from each other, but remain parallel. Typical efficiency for inline gearboxes is 95% to 98%. Another inline option that is commonly used is planetary gearing. These units are very efficient and can produce the same amount of torque but in a much smaller package. These units keep efficiency high by having a small contact area between the gear teeth, so there is less friction between the gears. Planetaries use three or four planet gears, a pinion gear, and a ring gear to transfer torque in order to keep the size of the gearbox smaller. Planetary gearing comes in a variety of output styles and accuracy options for even the most demanding applications. Typical efficiency for planetary gearboxes is 90% to 97%. Finding the efficiency for gear reducers is not always easy. Many speed reducer manufacturers do not publish efficiencies in their catalogues directly; however, easy calculations can be done to figure the total efficiency for a particular gear reducer. There are many different gearing options available on the market today that can meet the needs of your application. These options will be available at many different prices for initial cost, but the gearbox efficiency over time will save money in the long run. In one STOBER case study, converting 111 worm gears to helical bevel units and changing to a high efficiency motor had an energy savings of $23,000 per year based on 8,000 hours of runtime per year and a cost of $0.076 per kWh. That’s one big reason it is better to spend the money up front to purchase a more efficient reducer and motor than lose money over the long run.